The Morgana DigiBook 450 is a higher productivity model perfect binding binder that is ideally suited to litho and digital printers who require short to medium runs of PUR perfect bound books. It has the same innovative glue application and cleaning system as the DigiBook 150 and 200, with the PUR glue being applied on the book spine and on the sides by independent glue slots. The amount of PUR glue is determined by the height of the applicator and the pressure applied giving complete control and allowing any kind of book to be bound with maximum ease. The DigiBook 450 can bind up to 450 books per hour, with 4.7" up to 17.71" spine length, 0.07" to 1.96" spine thickness, and 4.7" - 16.5" book height. The DigiBook 450 is easy to use and operated via a touch screen panel with icon graphics that allow the programming of all precision operations in just a few seconds. There are a thousand alphanumeric memories available, which enable repeat jobs to be saved for later recall, thus providing totally automatic set up. Another key feature of the 450 model is the sophisticated milling and notching tools which gives the optimum spine preparation of the book block to interact with the PUR glue. Additionally, the DigiBook 450 has a completely retractable milling system allowing for the production of sewn book sections. The nipping press is a pneumatic system with adjustable lateral pressing force. Pressing time is also adjustable from the panel with a range from 0 to 30 seconds. The press height varies from 0 to 0.05" for optimal squaring of the spine and quality of glue application. It comes as standard with an automatic cover feeder to give increased production. The cover feeder can also be equipped with an optional scoring attachment which will eliminate the need to pre-crease covers. In addition to the automatic cover feeder, the DigiBook 450 is also equipped with an automatic book delivery and stacking section to maintain output speeds and reduce handling of the bound books. Looking for high production automatic perfect binding machine? 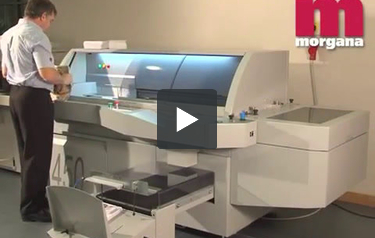 Look no further than the Morgana DigiBook 450 PUR Automatic Perfect Binding Machine. Automatic delivery and stacking of finished books. Book length, max/min: 17.71"/ 4.7"
Height of book, max/min: 16.5 /4.72"
Cover dimension max: 27.60" x 17.71"
Cover dimension min: 9.52" x 4.72"
Dimensions: L 101.8" x W 82.3" x H 54"